The path to get here is so much longer than the recipe itself. Great apple cider vinegar is not hard to make. Let me repeat, great apple cider vinegar is not hard to make but most people are not hanging around on a Sunday and suddenly think that they need to start making their own apple cider vinegar. I’ve been experimenting with vinegar for years. And like most people I have boughts hundreds of gallons for cooking, cleaning, etc. So what brought me to making my own apple cider vinegar? Was I sitting around on a Sunday thinking about it? No, but what I was doing one fine Sunday was heading up toward the apple orchards near Princeton, New Jersey for a friends and family outing. You can pick as much as you can carry and that day we overestimated the amount one family could possible eat in a month. 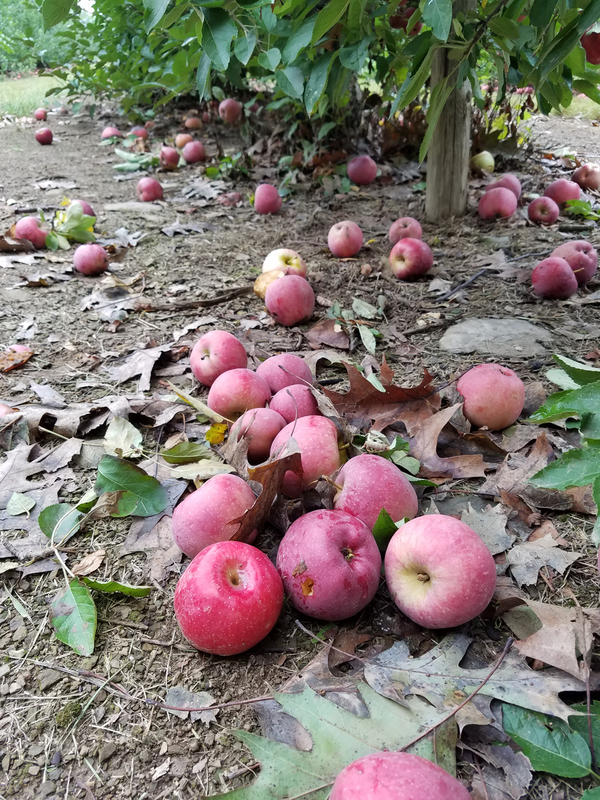 Naturally the apples are everywhere and were absolutely freakin delicious – crisp, slightly tart, and full of juice. They had that hard crunch you can only seem to find from an orchard. It wasn’t long before we had bags and bags of apples….just too easy. 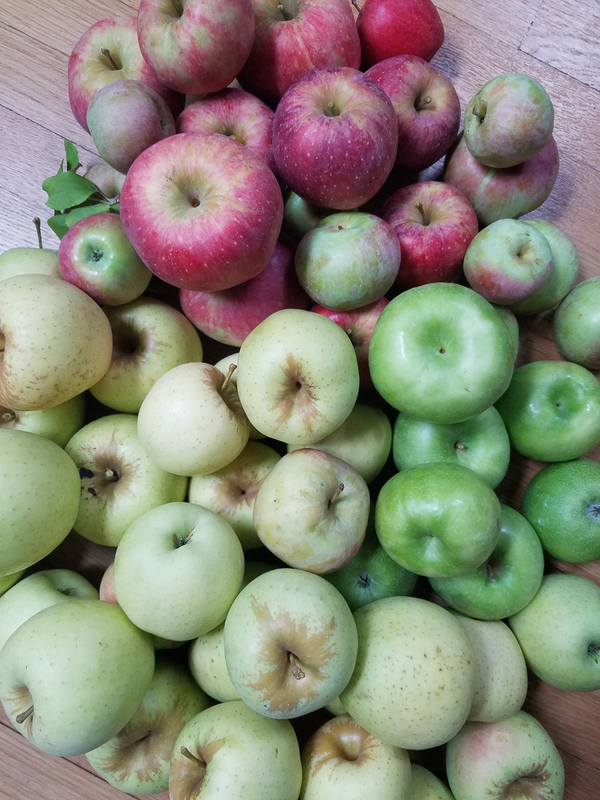 So after gorging myself for days, eating pies, making apple juice, apple sauce, apple soda, apple strudel and a whole array of other apple recipes I still found myself with lots o’ apples. I was contemplating even making some sort of apple kombucha and then it hit me. I know what I’ll make – some hard (alcoholic) apple cider! After some quick research I decided I didn’t quite have the tools or the focus for that…at that point. 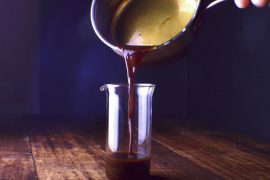 While I was linking article to article I saw a related blog about vinegar. There we go. That’s when I actually decided to forge ahead and start making my own apple cider vinegar. I never looked back. Note: There are so many articles on the interwebs clearly showing relationships between health and vinegar (e.g. 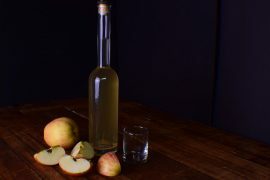 http://www.cnn.com/2017/04/18/health/apple-cider-vinegar-uses/index.html). It’s hard to go back to store bought after you make your own. I had about twenty five pounds of apples to play with but you can add or subtract however much you want. That’s not the important part. Cut them up in cubes and put them in a big non-reactive glass container that I sometimes use while making beer. Measure out a bunch of filtered water and add it to the cut apples. This is the important part. For me it took about three gallons of water to fill them all up. Add three and half cups of raw cane sugar. I generally use a tablespoon for every cup of water I put in. This why the amount of apples is not as important as the water to sugar ratio. Stir everything around until the sugar dissolves. It’s ok to bruise or thrash your apples a bit. Cover the container with a cheese cloth. After a week or so (depends on climate factors) I could see all this good bacteria making the solution cloudy. This is ok.
After another week take a peek. Stir it around a bit. There may be some foam that you can remove if you like. If it starts to have the unmistakable vinegar smell, then it’s time to strain the liquid. Toss the apple pieces into the compost if you like. Taste the vinegar. It should have that acidic (acetic) bite with strong vinegar notes. If it’s where you want it, then bottle it and store. If you are food obsessed like me you can buy some PH paper and test the actual numbers and see if you fall in a range you want. Apple cider vinegar will keep for a long, long time. It’s an acidic solution. Generally things don’t like to grow in those solutions. That’s why some people use this for cleaning but not me. Not after all the time I spent carrying those damn apples all around. 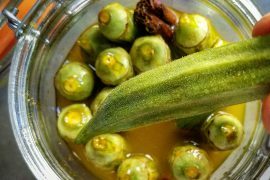 I take shots of it and use it in cooking. You should do the same. Enjoy the fruits of your labor. Apples. Lot of fresh apples. 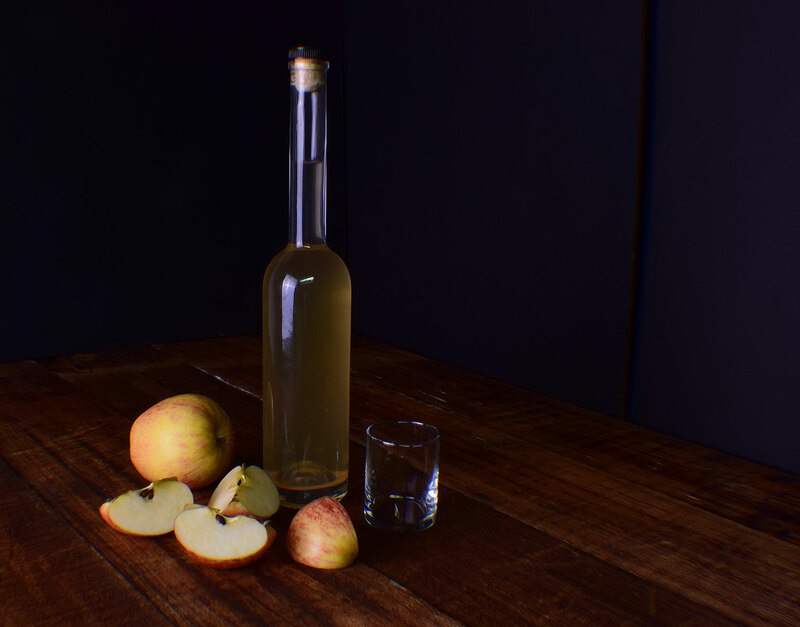 Read the blog for making Apple Cider Vinegar.